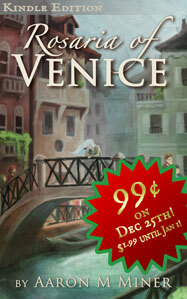 The Kindle edition of Rosaria of Venice, Book One of The Renaissance of Rosaria Adalberto, is on sale for the holidays! In the year 1491, during a steam-powered Renaissance, Rosaria Adalberto seeks a theory of electromagnetism—but finds conspiracy and intrigue instead. The Kindle ebook will sell for 99¢ on Christmas Day only, and $1.99 every day thereafter until the New Year. If you have yet to experience the Steampunk Renaissance, this is your chance. Buy the Kindle ebook today! Readers and other visitors might have noticed that the site has assumed an ugly, misshapen look. Apparently, updating my WordPress theme has more or less broken the website and I am presently trying to piece it back together. Please bear with me. As work progresses on Book II, I am also taking some time to update the Rosariabooks website and my author blog at Runicfire.net. As part of this effort, I am adding a News section to Rosariabooks.com. The News section will feature updates on Rosaria of Venice, The Sin of Prometheus, as well as announcements regarding this website, convention appearances (when they occur), interviews, and good press. Some of these posts will be cross-promoted on Runicfire.net, and many of my blog posts on Runicfire.net will be cross-promoted here as well. Please stay tuned!